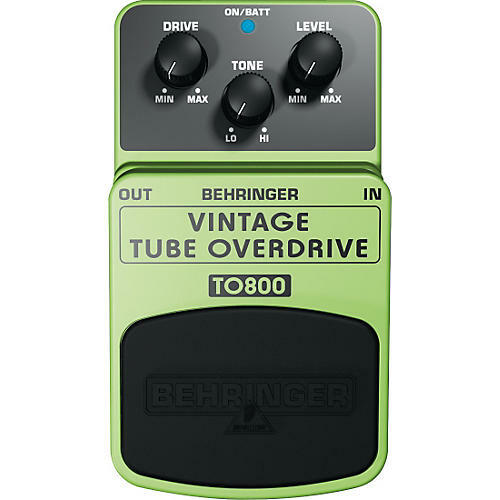 The Behringer Vintage Tube Overdrive TO800 offers you the classic sound of blazing, overdriven vacuum tubes. In order to recreate the sound of real-tube crunch, Behringer put the original 4558 op amps and legendary MA150 distortion diodes in the TO800, putting rock's most powerful overdrive sounds at your disposal. The resulting output is extremely faithful to that of the vintage tone machines that made rock and roll history. Dedicated Drive, Tone and Level controls let you shape exactly the sound you want. The status LED tells youwhen the TO800 is activated, and its top-quality on/off switch gives you the highest signal integrity in bypass mode.